The following month, I spent time in the wilderness again on a week-long trip in the mountains. While my friends hiked and climbed, I earned the nickname “Base Camp Babe.” I spent a lot of time reading books, swimming, napping and enjoying the beautiful alpine views. As the week went on, I ventured out on increasingly more adventerous hikes and climbs too. Jes loves rock climbing, hiking and outdoor photography. Ten years ago, she moved from a big east coast city to Vancouver Island, Canada. She writes about her outdoor adventures at jescott.ca. I’ve been talking lots to journalists lately for some reason. Not sure if it’s the blog or if I’m coming to be known as someone who answers the phone and talks to reporters, but I’ve been in the news a few times recently. First, there was the campus gym dress code story. See here. I also blogged about it, Sam changes her mind about gyms and dress codes. And then a sports reporter for the New York Times called and asked me about Chris Bosh. See Chris Bosh’s Desire to Play Leaves Heat at an Ethical Crossroads. So far so good. But I got stumped when a journalist working on a piece on New Year’s resolutions asked me for unorthodox advise I’d give to people just starting out. Here’s the question: Please share three, perhaps-surprising/unorthodox things would you recommend women do to kick-start their fitness journey. I did one does in these situations. I texted for outside help. 1. Use your imagination to seek fun. Think and research beyond the usual treadmill, aerobics, and yoga until you find a sport or activity that when you picture yourself doing it, you’re having a blast. 2. Don’t underestimate the importance of convenience. The effort you put into getting to a thing, whether it’s driving across town or choosing an outfit you’re willing to be seen in, is part of that activity. Choosing things that are easy to access for you will improve your chances of sticking with them long-term. 3. Community is important. Whether you find a place that has it, or build your own by working out with friends, doing things with people is way more fun! What’s your answer? What unorthodox advice would you give to someone just starting out? Wow, not even chubby babies get heads these days! We’ve written before on the blog lamenting the lack of heads on fat people photos. See Why the “headless fatty” photo has got to go (and other headless images, too) and No more headless fatties, why not use images of active fat people complete with heads instead? But back to the headless fat baby. Here’s the link to the article on childhood obesity in Canada. It talks about obese three and month olds. My only experience here is as a parent and I was told not to worry about the weight of my babies–at that age they were just getting breast milk–and if anything, I was nervous about them gaining enough weight. Largely though it felt out of my control. Of the three kids they were very different sizes and weights at 3 months with nothing different on the menu. Lots of friends chimed in and said the headless baby looked their now average sized kids as infants. I was kind of reassured by the chubbier of my kids. I felt like I didn’t have to worry if they were sick for a few weeks. Anyway, as noted this is way outside my area of academic expertise. For a discussion of healthy baby weights, go read all the books. But, I do think it wouldn’t hurt to give the kid a head. I doubt babies in diapers are embarrassed by their size quite yet. Give them a few years. Sigh. Here’s a Throwback Thursday about excuses. I’ve talked to a lot of people lately who have had that “hoping for rain” thing going on so they could skip a run or other outdoor activity. 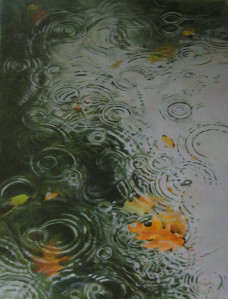 If I’m hoping for rain (as I was last night), then maybe I need to take a break (as I did last night even though it didn’t in fact rain in time). How about you? Do you feel like you “need an excuse” or do you give yourself permission to take a break when you need it? That got me thinking about excuses more generally. Here are some random musings about excuses. Most of my early morning activities are indoor: yoga (6:30 a.m.), weight training (6:30 a.m.), swimming (6 a.m.!). So the sound of rain doesn’t excuse me from much. Rain got in the way of my first ride on the road bike, postponing it for a week. But that just disappointed me. 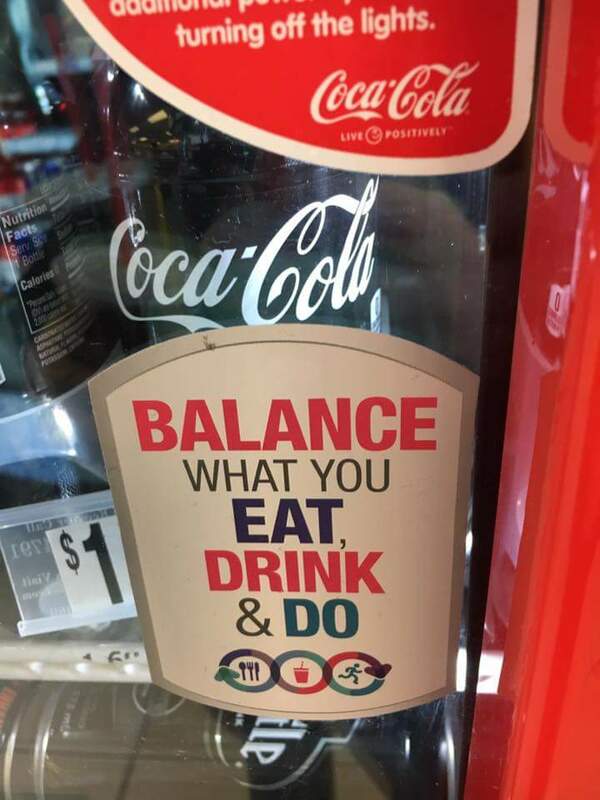 Is Coke part of the balanced life? This image came through my news feed from various sources, all praising it for the message of moderation. Coke isn’t evil, after all. The good life can include Coke. Thinking of Sarah here, a big fan of the drive thru large Coke with extra ice. Me, I wasn’t so quick to praise the labeling here. And it’s not because I think that Coke has no place in our lives. It’s a small place to be sure when it comes to my life. Last year, I was riding my bike at training camp in South Carolina. Day 1 nearly killed me. I was slower than everyone else and it seemed like I might not even make it back to camp. Chris pulled me aside and made me ride over to a gas station where he handed me a bottle of coke. Drink this! I did and the sugar/caffeine combo so beloved of bike racers everywhere helped. I made it back to camp. I wasn’t even last on all the hills. No, my worry is more about labeling food in terms of exercise. I’m not sure it helps. I’m not sure it’s right. And I’m not sure it’s always healthy to think of food in terms of how much exercise it will take to burn it off. Here’s the “honest version” of the Coke anti-obesity ad. But as hard hitting as it is, the ad quotes the American Heart Association’s recommendation that people drink no more than 450 calories a week from sugar sweetened beverages. That’s about 3 cans of Coke. So that’s not no soda or no pop. What do you think? Helpful or not helpful? This is a follow up to my previous blog post on party runs, which I published in anticipation of the 2016 Mudmoiselle London fundraiser for the Canadian Cancer Society. In my previous post I had signaled some concerns about party runs, highlighting examples of runs that are currently available in North America. So, here’s me reporting back on where the Mudmoiselle stands in relation to these concerning issues. The corporate issue: The event was well-organized and fully stocked with smiling volunteers; cheerful music; and a series of tends for registration, bag check, and changing. The Mudmoiselle “template,” with standardized pink/yellow/teal colours, was used for signs and medals. Registered participants received modest draw string swag bags with a shirt, trial-sized protein bars, and assorted gift certificates. 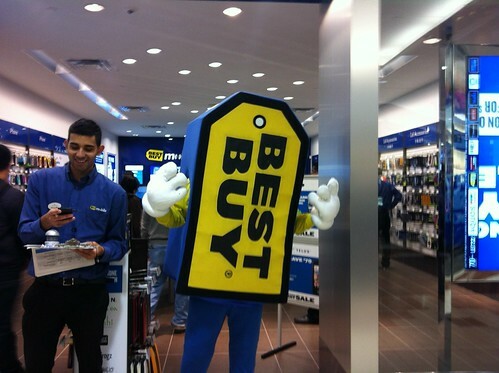 About the only noticeable corporate branding was a guy at the photography booth dressed up like a Best Buy ticket. What I think I liked most about the run was the camaraderie it inspired. There were some cooperative obstacles, but it was the occasion itself that brought out our team’s support for each other. That’s something no amount of sponsorship could buy, and perhaps it was in part because there was little corporate presence that we could focus on motivating and having fun with each other. The “dress up” issue: Our team chose “business slick” attire: white men’s dress shirts, ties, sunglasses, and lipstick. Our costume was determined less by gender norms and more by what was comfortable but also ironic for a mud run. At our after-run lunch back at the captain’s house, our team was already talking about next year’s costume. Most seemed to like the idea of formal gowns. The health issue: The course was not competitive, or even timed. An announcer warmed up teams at the start line. The obstacles were challenging, but not insurmountable. And some were quite amusing. Our team particularly liked the diagonal pole we had to slide down (with the aid of applied lubricant) to avoid falling into a mud pit. We encountered encouraging signs (“It’s just a hill; get over it”), water stations, and cheers from by volunteers and medical staff. So, it was a healthy activity, but afterwards we chose to have pizza and beer. The environment: On this well-marked course we ran up and down a local ski hill on a beautiful, sunny day. We pulled jeeps in neutral, flipped large tires, and navigated through strings pulled taut across woody bike paths. Other than the water and soap to make a “slip ‘n slide” down a larger part of a hill, most obstacles seemed to use existing spaces well, and did not seem environmentally damaging. The fundraising issue: The London Mudmoiselle met its fundraising goal—nearly $80,000—and our team met its own goal as well. I took my fundraising seriously, and through asking friends and family for donations raised almost $900. While I may have ran the Mudmoiselle run, it’s those who donated to the charity who are the real champions of the day. So, I’m listing below those who donated for me to acknowledge their generosity. I had only one family member refuse to donate to the CCS because he thinks they aren’t transparent about how they manage their funds compared to other charities. And while the day served the purpose of fundraising, at the starting line there was no explicit mention by run organizers of the charity or its efforts (at least none that I had heard). Overall: As an event that emphasized fun, friends, and health, but without over-the-top competitiveness or a barrage of corporate gimmicks that undermined the run’s social purpose or personal benefits, Mudmoiselle’s pros and cons netted out pretty evenly for me. It was a party run, but it was fun and it promoted an inclusive type of “partying” that many would find to be a welcome alternative to a traditional booze bender on a Saturday (complete with ties around our heads). At the end of my birthday run on Saturday, September 24, 2016. Happy 52nd birthday to me. Saturday I turned 52. I’ve been working without a day off since the day after Labor Day, and Saturday was no exception. I was at the Ontario Universities Fair in Toronto, a “trade-show” style event where over one hundred thousand people — high school students and their parents — come through the Metro Toronto Convention Centre to find out about Ontario universities. So I woke up in Toronto on Saturday ready to work my second day of the fair and went for an early morning run so I could start the day off well. And not just the day, the upcoming year. When Sam and I started this blog back in 2012, we had just embarked on our Fittest by 50 Challenge. Through that challenge, in the lead up to our 50th birthdays, running became an important part of my life. So it made sense to me that even though I would be on my feet for about 8 hours a day, three days in a row, a great way to clear my head and start my birthday shift would be with a run through downtown Toronto. And I’m glad I did. I’ve not had a lot of time to take stock, which is something I like to do when birthdays roll around because it gives me a sense of what’s changed and what’s ahead. But here are my plans for the upcoming year. I’m trying to make some decisions about my future on the bike. You may not know this if you’re not a regular reader, but I’ve got a bit of a phobia about training on the road. So that’s held me back for the past couple of seasons of triathlon. In 2015, I cancelled two Olympic distance events. This past summer I didn’t even bother to sign up. I sold my road bike to Sarah. But I still have my TT bike. In the short term, my winter bike goal is to do two spin classes a week at the Y.
I’ve signed up for the Key West Half Marathon on January 15, 2017, along with Rebecca and Anita. I’m considering a training clinic, either for a half marathon or for the Around the Bay clinic (not sure if I wish to do the 30K on March 26, 2017). We’ll see. I got one of the precious spots in Gabbi’s triathlon swim training group at the Y on Tuesday and Friday mornings. That starts up on October 4th and I’m totally committed to making it out for that on a regular basis because there are 30 people on the waiting list and I would hate to sit on a space that I’m not using. Clearly I’m swim-bike-run training if I stick with all of these plans, and that would set me up well for a triathlon season next summer. I’ll very likely to Kincardine again and need to think about what else. Another thing on my agenda this year is gaining more self-compassion. To that end, I’ve started reading The Mindful Path to Self-Compassion by Christopher K. Germer. At different times in my life I’ve had a regular meditation practice. But that’s fallen to the side lately and I want to get it back. And I also want to loosen up my schedule so that I’m not dashing from one thing to another all day long, every day. Being kinder to myself is going to be a major part of my upcoming year. Finally, Sam and I have our Fit Is a Feminist Issue book coming out in the Fall of 2017. It’s a long time from now but we would (of course) love for the book to be a success. So doing what I can to get the book into the hands of as many readers as possible is another thing on my to-do list for the next year. What do you think about when your birthdays come around? What are your plans for the year to come?